horizon and by Sunset we mean their new Twist and Fantasy sofa beds. Coming in at 54 inches wide and 34 inches in height is the Sunset Twist Loveseat Sleeper. 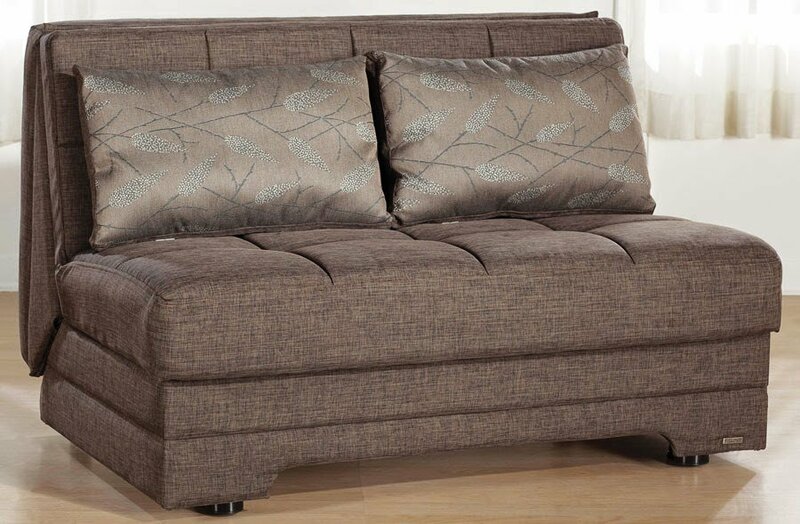 This sleek looking space saving sofa is perfect for small living rooms or guest bedrooms. The steel innerspring coil foam mattress unfolds to a full-size bed big enough for two, so you can go ahead and invite that couple in your life that’s been clamoring to come visit you for some time now. You won’t even have to deal with finding space for all of that stuff that comes with couples! The Twist features a built-in storage compartment, two throw pillows, and an effortless operation mechanism so you won’t look bad unfolding it in front of a guest. What’s better than a sofa? One that transforms into a bed, so you can sleep in and watch Sunday football, then convert back to a sofa so you don’t look silly in front of your guests. The Fantasy provides superior comfort without sacrificing much space in your living area. With it’s superior ergonomics providing a large sitting area, you and your friends won’t have to worry about finding a seat. If they decide to sleep over, just unfold it to reveal a Queen sized bed. Something that you can’t do that with traditional pull-out sofa-beds. Comfort isn’t a problem with the Sunset Fantasy, it’s cushions are fitted with innerspring coils that are wrapped in foam filling for a satisfying nights sleep. Want to maximize your comfort level? No problem. A Latex Mattress topper will provide comfort that most traditional beds can’t provide. Most pull-out sofa beds don’t come with replaceable parts – Sunset’s does. Sunset offers replacement parts on all of their products. We’ll even handle the installation for you.